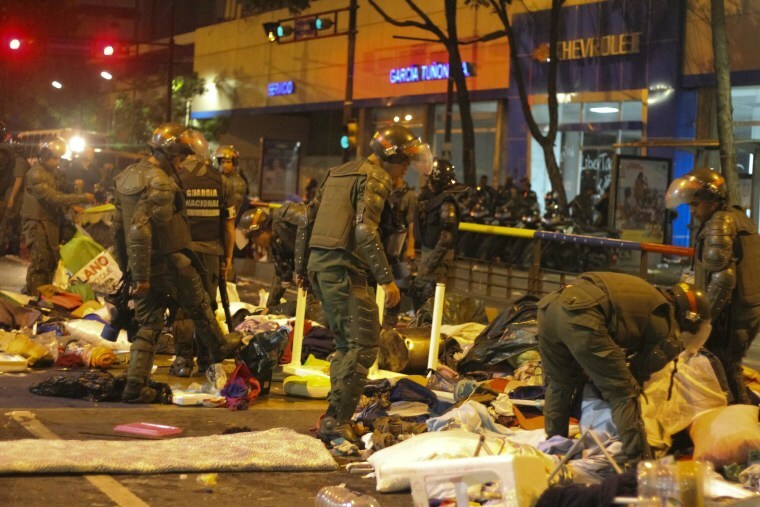 Venezuelan security forces conducted a pre-dawn raid in Caracas Thursday and dismantled camps which housed anti-government protesters, arresting 243 young people. A police officer was killed in violence following the raids, pushing the death toll to 42 since the clashes between opposition groups and the government started in February. Speaking after the raids on national television, Venezuelan president Nicolas Maduro blamed the death of the police officer on "right wing assassins," stating that is why the government needed to apply the "firm hand of justice." Some in the country view the raid as a straightforward crackdown to restore order, others an attempt to chill student activists. Still others in the opposition saw it as an effort to revive a waning protest movement to distract Venezuelans from mounting economic woes. Former opposition presidential candidate Henrique Capriles denounced the raids on Twitter as a "tired government strategy to hide the economic disaster and debacle with arrests and persecutions." The dismantling of the camps came as protests have lost much of their fervor amid an effort by moderate members of the opposition to sit down and negotiate, a strategy the Obama administration supports. But Venezuelan students and hard-line opposition members are boycotting the talks, which they consider a ploy by Maduro to deflect foreign criticism. In the U.S., lawmakers in Washington pressed State Department officials to endorse legislation that would ban visas and freeze the assets of Venezuelan officials who crush demonstrations and violate human rights. Roberta Jacobson, U.S. assistant secretary of state for Western Hemisphere affairs, said some opposition leaders have urged the United States not to go forward with such a move. A new survey by Venezuelan polling firm Datanalisis found support for Maduro dwindling as food shortages and a 57 percent inflation take their toll on his base among the poor. His popularity, at 37 percent, is the lowest since he became president.